Serena Jensen, of Atlantic City, center, serves drinks to Ashley Citron, left, of Setauket, NY, and Courtney Schaeffer, of Brooklyn, NY, at the Bar Anticipation beach bar, in Atlantic City, Thursday May 22, 2014, the first day the bar opened. Servers Serena Jensen, of Atlantic City, left, and Sara Joyal. of Galloway, carry a food order as Steve White, top, of Buena Vista, and Joe Crean, of Egg Harbor Township, install a sign at the Bar Anticipation beach bar, in Atlantic City, Thursday May 22, 2014, the first day the bar opened. Thomas Jannarone, of Interlaken, owner of the Bar Anticipation beach bar, in Atlantic City, Thursday May 22, 2014. From left, William Watson, of Atlantic City, and Brenda Oldroyd, of Egg Harbor City, plant some of the 3,000 plants in front of Caesars Atlantic city, in preparation for Memorial Day weekend, in Atlantic City, Thursday May 22, 2014, the first day the bar opened. The two work for Parker Plants. 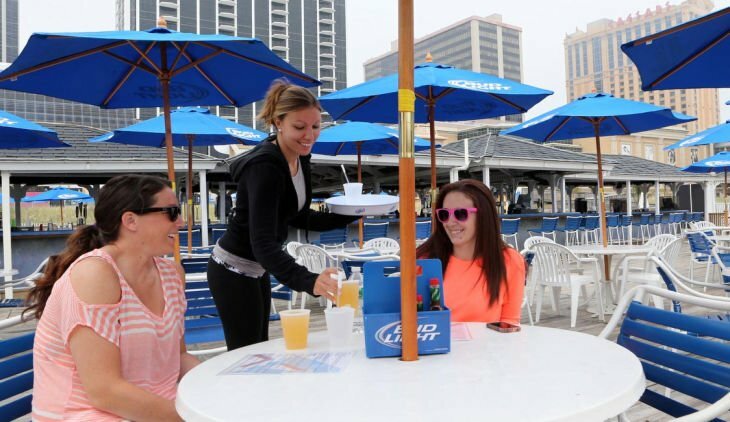 Serena Jensen, of Atlantic City, center, serves drinks to Courtney Schaeffer, of Brooklyn, NY, left, and Ashley Citron, left, of Setauket, NY, at the Bar Anticipation beach bar, in Atlantic City, Thursday May 22, 2014, the first day the bar opened. Courtney Schaeffer, of Brooklyn, NY, left, and Ashley Citron, of Setauket, NY, have drinks at the Bar Anticipation beach bar, in Atlantic City, Thursday May 22, 2014, the first day the bar opened. From left, Jack Whitman, of Chatham, and Sarah Pagiocco, of Gillette, have lunch in a gazebo at the Bar Anticipation beach bar, in Atlantic City, Thursday May 22, 2014, the first day the bar opened. ATLANTIC CITY — It was calm Thursday afternoon at Bar Anticipation, which had just opened its doors for the first time. A few patrons of the city’s newest beach bar chatted idly at a table under overcast skies. Wait staff joked by the bar, and co-owner Thomas Jannarone worked out some final details on his laptop. That peace will be shattered there and elsewhere today as tens of thousands of visitors descend on Atlantic City and the rest of the shore area for Memorial Day Weekend, the de facto start of the summer season. At Bar Anticipation — Bar A for short — the party begins Friday with a performance by cover band Johnny Drama, which Jannarone calls an “audio and video experience,” while elsewhere the duo Bacardi Ardi and Billy Reybert will spin an eclectic mix of pop tunes. At midnight, the bands will vacate to make room for a dance floor, which is expected to be packed until the wee hours of the morning, weather permitting. A sister bar to the nationally known club of the same name in Lake Como in Monmouth County, Bar A is replacing the Trump Plaza Beach Bar just off the Boardwalk opposite the hotel and casino. As it is up north, the bar’s selling point will be its eclectic mix of food, drink and entertainment, Jannarone said. A block away, Backyard Bar at Caesars was gearing up for its first summer season under that moniker. Co-owner Kevin Friel who managed the bar when it was known as Boardwalk Beer Garden and purchased it with coworker Craig Slotkin for this season, said he’s eager for the busy season to begin. “You look forward to this time of year all-year round, then when it comes, it’s a blur,” he said. Friel said the bar has been doing brisk business since it opened in April, but should pick up to a steady average of about 1,000 people a day this weekend and continue at that rate through the summer. Like the staff at Bar A, Friel and Slotkin were relaxing Thursday, taking it easy before business booms. But with Memorial Day Weekend looming, Friel said he can’t wait. At Bar Anticipation, the famed Shot Wheel won’t be ready in time for the weekend but should arrive shortly after, Jannarone said. Bar A will also offer a 10,000 square foot 21-and-up section on the sand, which Jannarone said was a no-brainer use of the city’s greatest asset. Atlantic City may not be turning out the lights just yet, but it may ask to turn down the music.